There is a wide variety of natural stone that may be used for kitchen countertops. Soapstone has been used to as hearth, fireplace and countertop material from ancient times and is still very widely used. Soapstone imparts a warm look to your kitchen and can be used to achieve a rustic and traditional, as well as contemporary look to your kitchen. Below you will find frequently asked questions, pertaining to soapstone. ANSWER: Soapstone is a metamorphic rock, which comes in varying degrees of hardness. It is composed of talc, magnesium silicate, and chlorite. QUESTION: Where does soapstone come from? 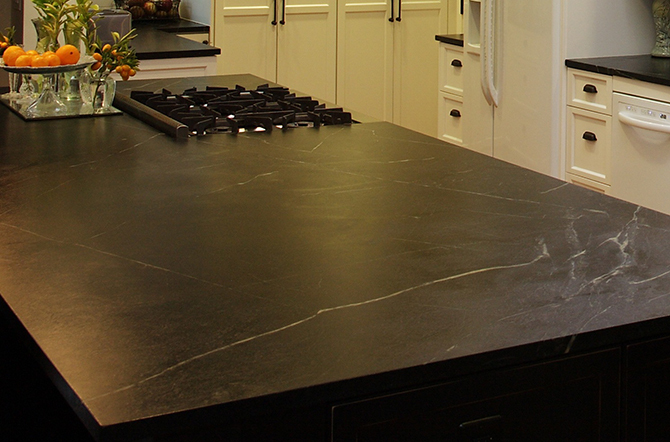 ANSWER: Soapstone is quarried from Brazil, India, Finland, Switzerland, and the USA. Brazil is the #1 producer of soapstone. QUESTION: Are there different kinds of soapstone? ANSWER: Soapstone varies in color, hardness, and purity. It’s a darker natural stone and comes in shades of grayish to green to blues, and charcoal gray. 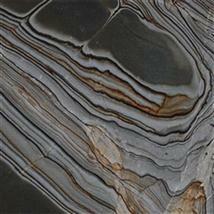 Random markings include white veining, shades of green, amber or beige in the shape of veins or other formations. Artistic soapstone has high talc content, is very soft, and is used for carvings, chalks, and welder’s pencils. 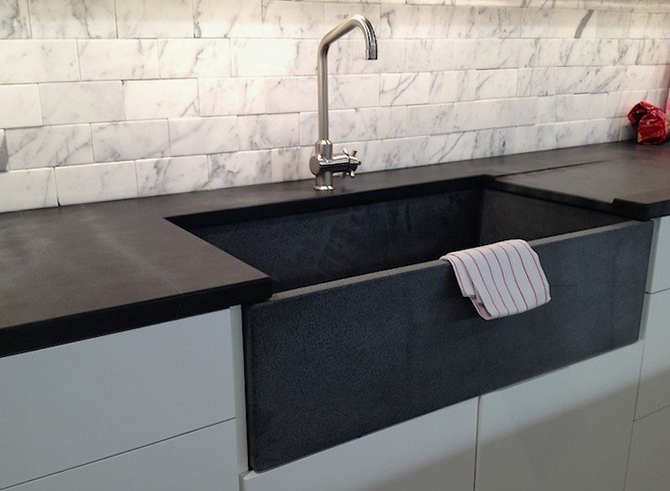 Architectural soapstone has lower talc content and is used for sinks, soapstone countertops, floors, and other architectural items. QUESTION: What is soapstone used for? ANSWER: Backsplashes, bathroom vanities, bathtubs, benches, bowls, cooking pots, countertops, fireplaces, fireplace fireboxes, fireplace surrounds, floors, furnaces, lintels, pizza stones, planters, sculptures, shower stalls, sinks, table tops, and window sills. If you can imagine it, you can probably use soapstone. 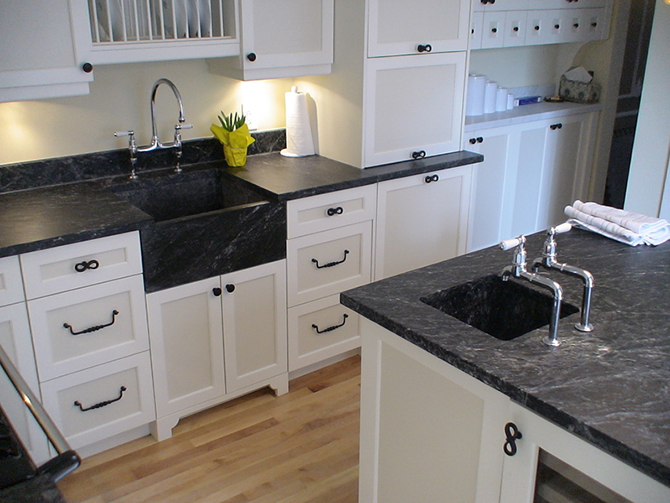 ANSWER: A soapstone countertop will last many lifetimes. It is a dense natural stone, which allows nothing to penetrate it, not even bacteria. It is impossible to stain and unaffected by heat. QUESTION: How does soapstone wear? I have heard that it is a soft stone. ANSWER: Yes. Soapstone is a soft stone. The edges will soften and your soapstone countertops will accumulate some nicks, scratches, and dents. The scratches can be removed with a light sanding. Otherwise, these little nicks and scratches become part of the patina. ANSWER: Yes. 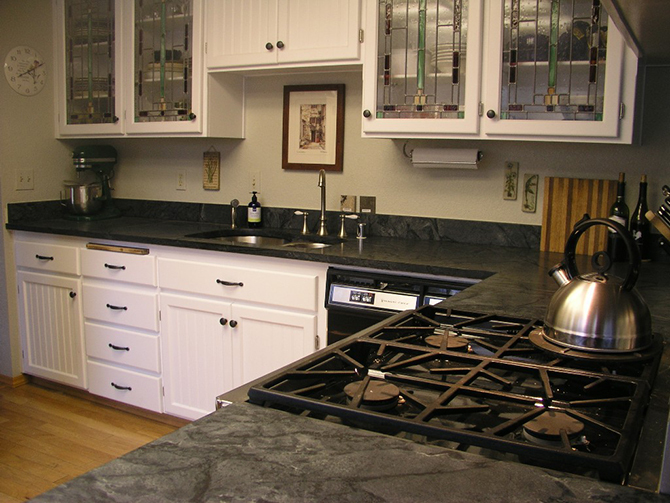 The beauty of soapstone is that it can easily be repaired by the homeowner. QUESTION: How do you repair scratches on soapstone? ANSWER: A simple wipe with mineral oil and the small scratches are gone. For deeper scratches, a light sanding followed by mineral oil will remove any scratches. QUESTION: Why is it recommended to apply mineral oil to soapstone? QUESTION: How do I apply minerals oil? ANSWER: Use a soft, clean cloth. Apply the mineral oil to your entire counter and then wipe up any excess oil with a soft clean cloth. QUESTION: How often do I apply mineral oil? Immediately after it is installed. After your initial application, apply once a week for the first 6 months. Then, once a month for the first year. QUESTION: Will applying too much mineral oil damage my soapstone top? QUESTION: What shall I use to clean my soapstone surface? ANSWER: Any household cleaner and a damp cloth or sponge.